AUSTIN, Texas — The five living former presidents put aside politics and appeared together for the first time since 2013 at a concert on Saturday to raise money for victims of devastating hurricanes in Texas, Florida, Louisiana, Puerto Rico and the U.S. Virgin Islands. Texas A&M is home to the presidential library of the elder Bush. At 93, he has a form of Parkinson’s disease and appeared in a wheelchair at the event. His wife, Barbara, and George W. Bush’s wife, Laura, were in the audience. Grammy award winner Lady Gaga made a surprise appearance at the concert that also featured country music band Alabama, Rock & Roll Hall of Famer ‘Soul Man’ Sam Moore, gospel legend Yolanda Adams and Texas musicians Lyle Lovett and Robert Earl Keen. The appeal backed by the ex-presidents has raised $31 million since it began on Sept. 7, said Jim McGrath, spokesman for George H.W. Bush. Those who voted for Trump debate how much support the federal government should give Puerto Rico. “This wonderful effort reminds us that we truly are one nation under God, all unified by our values and devotion to one another,” Trump said in the greeting, played during the concert. Four of the five former presidents — Obama, George W. Bush, Carter and Clinton — made brief remarks that did not mention Trump. The elder Bush did not speak but smiled and waved to the crowd. They appealed for national unity to help those hurt by the hurricanes. “The heart of America, without regard to race or religion or political party, is greater than our problems,” said Clinton. The last time the five were together was in 2013, when Obama was still in office, at the dedication of George W. Bush’s presidential library in Dallas. Much of the island lies in the chokehold of a turgid, frustrating and perilous slog toward recovery. 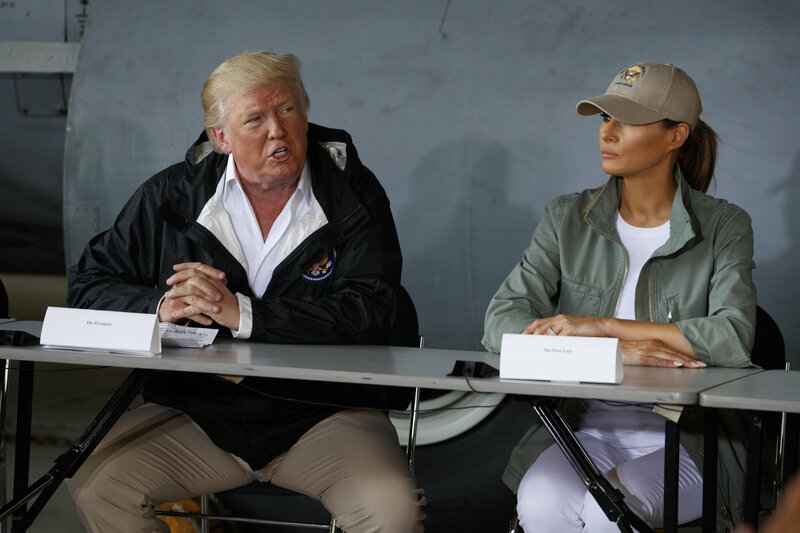 Amid criticism that his administration was initially slow to aid ravaged Puerto Rico, Trump accused island leaders of “poor leadership,” and later tweeted that, “Electric and all infrastructure was disaster before hurricanes” while saying that Federal Emergency Management Agency, first-responders and military personnel wouldn’t be able to stay there forever. But Rottinghaus said ex-presidents are seen as less polarizing than the current president. Hurricane Irma subsequently hit Florida and Hurricane Maria battered Puerto Rico, while both devastated the U.S. Virgin Islands. Is Puerto Rico Trump’s Katrina? Though Trump has staunchly defended his administration’s response to Hurricane Maria in Puerto Rico, his critics blame his slow response and mismanagement for turning the crisis into an even worse disaster.